This is a post that aims to go through the evolution of the “Hockey Stick” from 1990 to the present day. It naturally misses out parts of the story, which deserve far more analysis, simply to keep the post short. Comments that expand on the bits I’ve omitted are welcome! What is the “Hockey Stick” and who cares? One of the key areas of controversy relating to climate change and the body that synthesises all the science – the Intergovernmental Panel on Climate Change (IPCC) – is the so-called “Hockey Stick” graph that first appeared in the IPCC in 2001. The graph is important because it tries to reconstruct large-scale temperatures for the past 1000 years or so to put the current warming in context. There have been several official (and controversial) inquires and reports on the science and the scientists. Two of the most well-known are the NRC Report and the Wegman Report. The Climate Audit blog, and its many followers, have been picking at the science, the raw data and the method that produced the “Hockey Stick” for a long time. 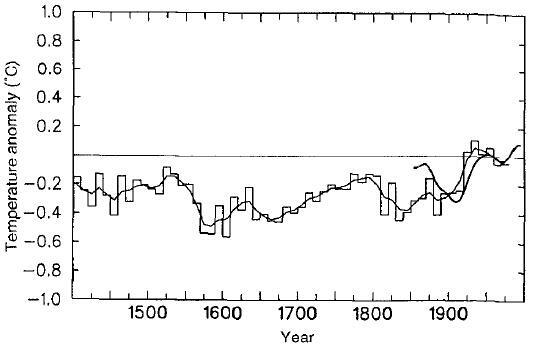 The Bishop Hill blog has many posts on the “Hockey Stick” and the man behind that blog has even written a book about the graph (I’ve not read the book but I’d like to review it for this blog soon). It’s a composite overview of the evidence available in 1990 from ice cores, tree rings, historical records and other so-called “proxy” measures of temperature. This field of research was in its infancy so the schematic wasn’t highlighted much in the report. However, this plot is still referred to by a lot of people as the temperature at the “present day” end of the graph is not the highest value on the plot. Given that it’s essentially a sketch, I’m surprised that people read much into this plot. For example, the usually meticulous Science of Doom was, in my opinion, off the mark with his analysis of the development of the science here, skipping straight from the First to the Third Assessment Report version to imply that something underhand was going on. This doesn’t represent the scientific progress properly. So, we’ll look here at the parts of the story that SoD missed out. So where did the science go between the FAR and SAR? It seems that it went backwards; the SAR reconstruction only goes back 600 years and not 1000 years like the FAR. This plot is a composite of all the “best” proxy climate data available at the time of writing the TAR – you can find the plot and lots of background information here on pages 130-136 of the TAR. As hinted at in the SAR, there was a lot of new work looking at these reconstructions between the SAR and the TAR so it goes back further and includes regions of uncertainty. This did not go down well with some people (and the language was toned down in the subsequent IPCC report). The raw data, the methodology and the statistical tools used to produce the graph have all been examined in great depth. Everyone from bloggers to the US Senate have been interested in it. It must be one of the most intensely scrutinised graphs ever produced. But it’s only a graph, so why all the fuss? In my opinion, using relatively new science to advise policy makers on issues that affect the whole population’s way of life is bound to throw up problems, especially if you don’t like what the message is. But that was the situation that the IPCC was in and they were probably right to stress the importance of this graph – it was new science but none of the investigations into it have landed a killer blow. Indeed, maybe all the scrutiny would help the science develop faster and become more reliable. Here is the most recent IPCC “Hockey Stick”-type plot. Its background information can be found here in the AR4. 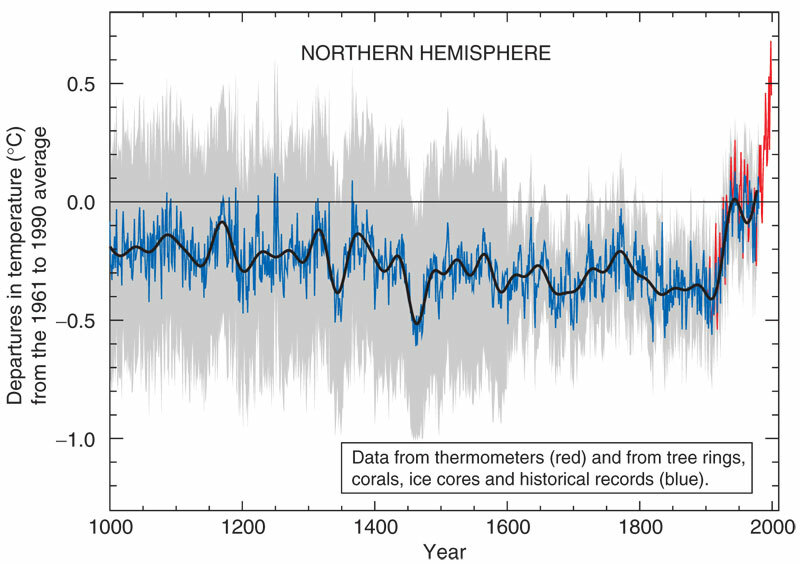 Despite all the attacks on the 2001 “Hockey Stick”, an improved version was included in the 2007 IPCC report. The report discussed the peer-reviewed criticisms of the methodology, which the IPCC deserve credit for. Questions still remain over the statistical methods used in this graph and this does not make the discussion very accessible but here is a very quick attempt. The main conclusion from several of the relevant inquiries was that the statistical methods were not ideal but they did not change the result (i.e. the shape of the graph) in any significant way. To give a specific example, Lord Oxburgh’s review of the science concluded that the climate scientists should collaborate more with statisticians. This point is hard to disagree with. Some people, however, still believe that the statistical methods are a terminal issue for the “Hockey Stick”. Here’s Bishop Hill in 2008 on the stats (from a very “sceptical” point of view). He also reported on a couple of papers that aimed to refute the major criticisms of the methods and their tortured journeys to get into the IPCC AR4 (although, having published in both GRL and CC myself, this story doesn’t sound as remarkable as Bishop Hill spins it!) And here’s a defence of the “Hockey Stick” methods from RealClimate in 2005. This argument is going to continue and the science will continue to improve. The thing that strikes me as odd, though, is that most of the criticism aimed at the “Hockey Stick” is still aimed at the 2001 version. I suppose that there is more ammunition to attack this version with – the data was very new, the methods were new, it was high-profile and the CRU emails give new opportunities to quote mine. I get the feeling that some of the “sceptic” community have put nearly all their eggs in this basket and it therefore needs to continue to attack the 2001 version. In the meantime, the science has moved on and improved. Indeed, the latest Mann et al. version of the work in PNAS has been questioned in the same journal and the response by Mann et al. showed suggested that some of those criticism were quite strange. So what’s going to happen next? I assume that the work of some of the key players may have been slowed a little because of all the inquiries they’ve had to deal with. However, as the field has developed other groups will have taken on the challenge and there are now more groups than ever (with new ideas and perspectives) working on these issues. Indeed, the IPCC has increased the prominence of this type of work for their next report – the outline for AR5 includes a whole chapter (Chapter 5) on palaeoclimatology – it was a chapter sub-section in AR4 and TAR. This is good news and hopefully we’re getting closer to truth, which is what the scientists wanted all along.